The ProShot Cheeta is the bigger brother of the Fox Cub, and provides superb accuracy and consistency at an affordable price. The Action and Stock are of mid size proportions, with the cheek piece on the Cheeta being slightly raised to provide easier scope positioning. The action is a spring powered break barrel action which is reliable and easy to use, and also has an automatic safety engaged each time the rifle is cocked to prevent accidental misfires. A 9 - 11 mm mounting rail is milled into the breech to allow a scope to be fitted, and open sights are installed as standard. 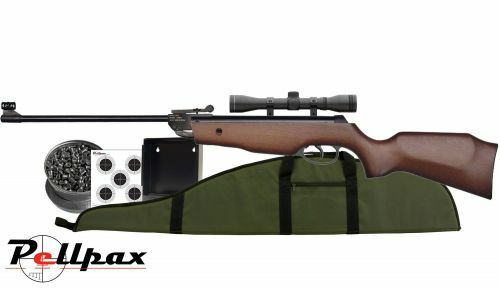 Included with this starter kit is the ProShot Cheeta .22 rifle, a 4x32 scope with mounts, a 14cm Target Holder, a pack of targets, and a tin of .22 Pellets to get you started. All of this comes pre assembled by our gunsmiths to save time once it is delivered. Add this item to your basket & spend an extra £355.01 to apply for finance.